OMG, So Not A Pit Bull!!! We have a little "Low-Rider" Pit Bull that is a regular Daycare client, named Tigga, whom Blue lovingly nicknamed "Rumproast". OMG, poor little dog... she's from the same bloodlines as Razors Edge, and Gottiline, that you frequently hear about, or commonly see advertised as "real" American Pit Bull Terriers, with the huge heads, apparently made to look like thick, brick shithouses (more like abominations of the Bulldog breed, if you ask me...). They changed the name, and are now calling them "American Bullies" to make them a totally "new" breed (probably because owners and breeders of *real* registered APBTs were getting pissed off with backyard breeders ruining these dogs). Anyway, when Tigga came into work this morning, I asked her owners what breeder they got her from, because I was curious. I've never actually seen one of these low-rider pits in real life before. So he pointed me to Bullies Den Kennels. 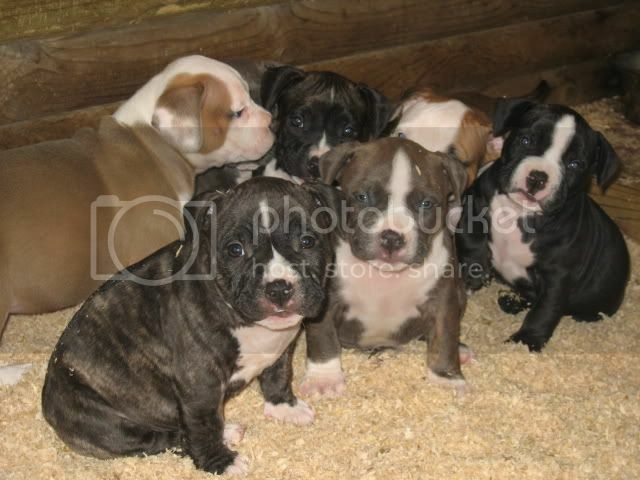 In browsing through the guy's website, we happened to find a pic of Tigga when she was a puppy (she's the brindle one at the very front)! OMG, cute friggin' puppies, but I tell ya, these poor dogs have such health issues! They have bowed legs and breathing issues that are almost as bad as English Bulldogs! Plus, watching Tigga try to go up and down stairs is just sad. She practically slides down them every morning. The way the breeding programs for dogs and cats is going its pretty damn scary especially for show purposes. where the look is way more important then say the overall health of the animal. Inbreeding is a serious issue. Since most people inbreed the poor things. Seriously cute puppy tho. Most of our cross bred dogs have lived longer lives with less health problems then the pure bred. Beauty is in the eye of the beholder. I have a 8 year old Shar-pei. Everyone tells me how ugly she is and how she "Has a face only a mother could love." I tell them I must be her mother cause I think she is the cutest thing on four legs. Nope, just another "scary" breed added to the chopping block. I think they are pretty too. But others see them as "scary and Dangerous" it's sad :(. Just like people find my dog ugly. I like calling them Terrestrial Manatees. Ya cross an EB, a blue pit, and a mastiff, feed it tons of Dog Chow, and that's what ya get. I can't stand most American Bullies (stupidest name EVER). They're cute as puppies just like many dogs are, but holy-hell are they f'ugly when they grow up. Not much better than english bulldogs, or even french bulldogs on sterioids.... just, omg, no. How can anybody look at those dogs and think they're real APBT's capable of doing anything other than sleeping? For extra points, I love it when "breeders" put logging chains or 3" thick spiked collars on those dogs for photos. The dog can barely walk it's so fat and flat-faced, and they insist on trying to make the dog look "badass". Ya might as well put a spiked collar on a Walrus and drag it around downtown on a leash! This is what happens when the breeding world encounters chibi form.